June design newsletter is here! Today I’d like to share a few small tips on a widely popular philosophy Feng Shui. These days, many people work from their homes, so following some simple ancient rules passed to us through generations can increase your productivity and even your mood. In our Green Corner I’d like to introduce an article on how large companies are fighting against small alternative energy companies to deliver commonly used types of services through a new system called Green Path North - electric highway. It also overviews how we can get off-grid and even sell our electricity to someone who needs it. 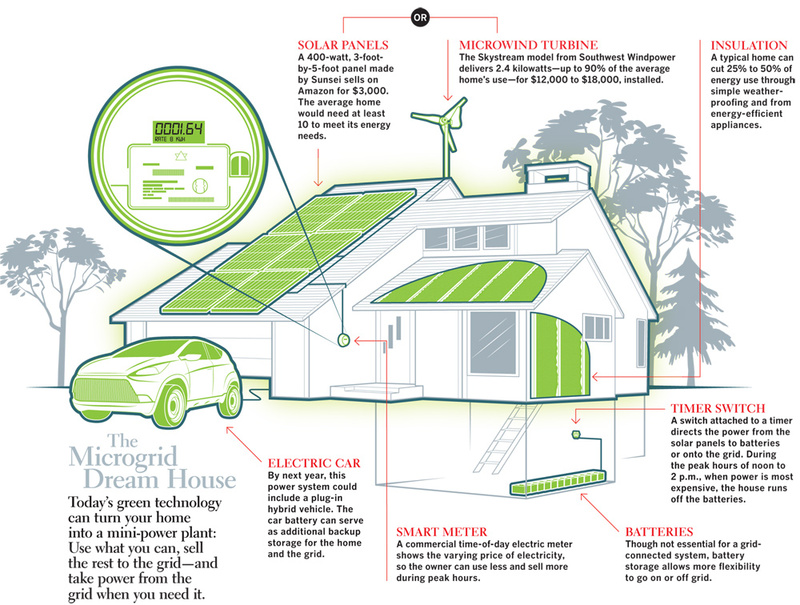 If one house on a block had this system we could have an off grid country! Keep reading. FENG SHUI – ANCIENT TRADITION OR LOGICAL PROCESS? What is Feng Shui ? Have you ever used Feng Shui in your life? Have you ever felt confused about its rules? My personal experiences with Feng Shui started from working with a Chinese client. Following some of the rules was challenging, others were impossible to achieve. We got into a lengthy discussion on the subject of Feng Shui and I ended up reading over 10 books to thoroughly educate myself and to be on the same page with the local traditions. 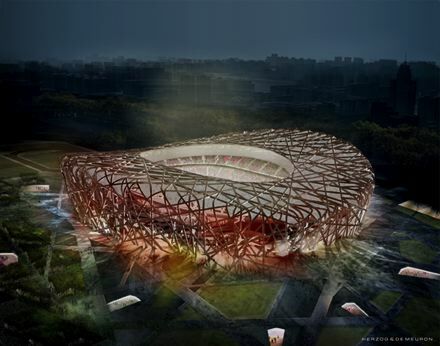 New construction for the Olympics in Beijing in 2008 awoke a large interest in European and American designers in China. Chinese local developers were looking for someone to bring a modern 'edgy' style that resembles the lines of the new stadium. But combining the new style with the old Chinese traditions became one of the challenges for western designers. I do not regret all the educational time. The more I was reading, the more I was realizing that this tradition is not something supernatural. Feng Shui is a quite logical set of rules that was created based on a long history of experiences by people living and observing. I defined and divided these principles into following areas of concern. 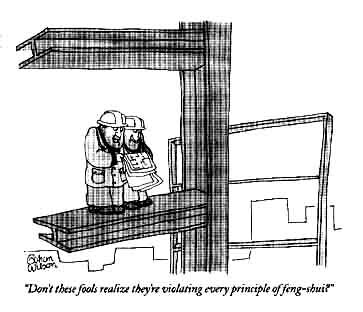 In my mind it became sort of a Building Code that was passed on to us from ancestors. 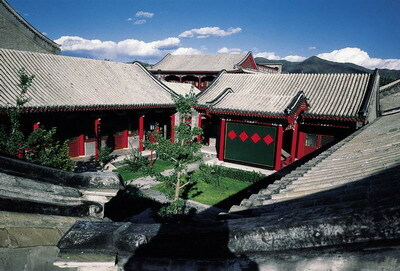 Courtyard houses of north China are an outstanding representation of traditional residences of China's Han nationality. After entering the main door and turning westward into the outer yard, one finds there are guest rooms, servant's room, a kitchen and a toilet. 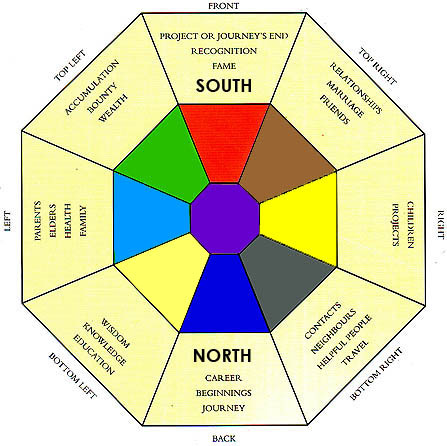 Most of you have seen the Feng Shui charts called Bagua. There are two different ways of applying Bagua on any given space. One is the Chinese traditional way, taking into account the location of North. And another one is Western, where the real location of North is disregarded. Let’s take a look at the chart and mentally locate your house within it. Now, think for a moment what corner of your life needs real improvements. Remember, that you should not be improving all the areas at once, as it can be too overwhelming for the energy, or I should say stressful for you. A famous saying goes: if it’s not broken, don’t fix it. So think only of those areas that you really feel you need help with. Place yourself at the Blue (career) corner facing south and take a look at your house comparing it to this chart. PROMOTE YOUR BUSINESS WITH US FOR FREE! 1. Career: motivational images, a photograph of an aspiration such as a university or of your goal. 2. Relationship: double everything: images of romance, two vases or candle sticks, a photograph of yourself with your partner, a collection of something, plants. 3. Family: family photographs and documents. 4. Wealth: coins, plants, empty bowls, indoor water feature that moves water. 5. Helpful people: telephones location, telephone directories and business cards. 6. Children: photographs of children, project details, your artistic and other achievements. 7. Knowledge: books, framed words of wisdom, pictures of a mentor. 8. Fame: certificates, newspaper cuttings, products of achievement. One more element for your home office: take a look at the location of your desk. Is it facing your door or is your back turned towards your door. 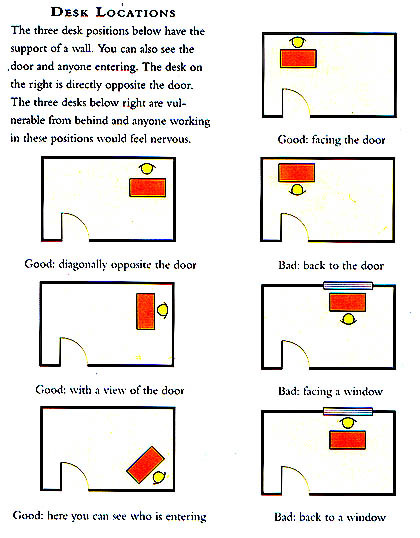 Working in an office you need to be in control and be able to see if someone enters your room. This takes away extra stress from your work day. Take a look at the position of your home office or an office desk. Try not to sit with your back turned towards an open door or a window. It adds an additional stress to your subconscious mind. As Feng Shui states it, by recognizing problem areas in our lives and taking positive steps to improve them, we can connect to the energy of the space around us and bring desired changes within us. I believe Feng Shui is all about awareness and connection to ourselves and to nature. "The evidence is growing that privately owned, consumer-driven, small-scale, geographically distributed renewables could deliver a 100% green-energy future faster and cheaper than big power projects alone. Companies like GE and IBM are talking in terms of up to half of American homes generating their own electricity, renewably, within a decade. But distributed power -- call it the "microgrid" -- poses an existential threat to the business model the utilities have happily depended on for more than a century. No wonder so many of them are fighting the microgrid every step of the way. ." Read more. INTERESTED TO LEARN MORE ABOUT REDESIGNING YOUR ENVIRONMENT?